We engage in heraldic display for the same reasons as the Medieval European nobility: To identify retainers; our property; to show allegiance; and ourselves; to assert rank and position; and to decorate our environment. As in Medieval Europe, opportunities for heraldic display aren’t limited to flags, banners and shields. Just as Medieval nobility did, you can put your armory on just about anything in your SCA kit, including clothing, accessories, furniture, boxes, tents, architectural features- and even pets and livestock. Clothing is a common and effective medium for heraldic display, and you don’t need to limit your use of your heraldry to martial surcotes, cloaks and tabards. You can put your heraldry on just about any garment, in either a large shield display or in a “diapering” or “powdering” (A repeat design that covers an area.) of smaller charges. A parti-colored cotehardie with a solid side and the other a diapering of your main charge. Your entire arms on parti-color in large appliqué over one half or overall counterchanged. Another cotehardie treatment for ladies: Your heraldic colors in checks or stripes on one side, with your arms on the skirt of the other side. Or, your heraldic colors, one color on top and hem, embattled or dagged, with the other taking up the area between. Alternate your arms and badge on a wide stripe of rectangles down the center. A large depiction of your main charge, or entire arms on one side of the skirt. Quarter your arms with a diapering of a charge from your arms or badge. Diaper your shield or lozenge all over the garment. A line of charges or shields around the hem. Your badge or device on the sleeve at shoulder or forearm. A lady’s sideless surcote can be partied per pale, with diapering, or checks and stripes in her heraldic colors, or with an appliqué of her arms on skirt or a smaller shield or lozenge on the chest. Another suggestion would be a plasteron in a wide stripe down the center with alternating arms and badge. A gentleman’s surcote or cyclas can use many of the same treatments. Embroidered trim with a linear repeat of your arms or badge, in a shield, roundel or rectangle, at neckline, sleeves and hem. Romanesque horizontal stripe embellishments with a heraldic design. Your shield on the chest below one shoulder. Your arms in a larger shield or lozenge center chest. Badge in roundel or shields diapered overall on a dalmatica. In the simplest form, the mantle of estate bore only the arms in a large shield on the back. A common form of display, particularly for members of knightly orders, was to place a charge or shield on one shoulder, at the point of the shoulder, point down. In spite of some assertions that these displays should only be on the right shoulder, period art shows them worn on either shoulder. It would be a good idea for an order, household or other group to keep the display consistent to one shoulder. Gothic illuminations, especially in France, show many mantles with overall diapering of heraldic charges. Heraldic theme orphreys perhaps alternating your arms and badge with the badges of your orders. Arms in full heraldic achievement on the center back. SCA peers commonly work charges and badges of their orders into the heraldic display of their mantles of estate, either separately, or worked into their achievements of arms. Heraldic charges or shields on hood battlements and dags. Arms & insignia of rank carved, engraved or attached onto coronets. On a hat- woven, appliquéd or on an attached metal pin, or woven into a hatband. Painted or embroidered in a shield, lozenge or diapered on the vamp of a shoe. Your arms embroidered, painted or appliquéd on the backhand and/or gantlet of a glove. Heraldic display knitted or woven into stockings. worked in Opus Anglicanum and Or Nué would feature lifelike scenes of courtly love, with heraldic elements worked into the scenery. Other forms of heraldic bag decoration were as simple as a shield embroidered on the front or flap, or diapered all over the bag. Painted on a sword scabbard. You could paint or embroider your arms on one corner of your handkerchiefs. Collars of estate are often made up of components of the wearer’s heraldic charges and insignia of rank. These could be cast metal or enameled components. Signet rings of your arms or badge for sealing letters. Necklaces with charges as components of the chain. Painted, stenciled, block printed or woven hangings with shields or charges diapered overall or scenes with heraldic elements worked in. Painted and/or carved wooden furniture such as chests tables and chairs. Tents are an excellent opportunity for heraldic display. The inner and outer walls, seams, dags and embattlements of the canvas are all traditional placements for shields and charges. Tubs and barrels can be painted with heraldic themes. Linens, such as tablecloths and napkins can be embroidered, appliquéd or painted. Camp walls and pennant barrier ropes can be painted with household and personal arms. Shield lozenge and roundel shaped wooden plaques can be painted and pole mounted at camp entrances. Pillows and cushions with your shield or lozenge embroidered on them. Glassware, ceramics, utensils, plates and other tableware can be painted, carved, cast, mounted or etched with your heraldry. Stained glass was a very popular medium for heraldic display in period. Personal items such as combs, cosmetic containers and mirrors were often heraldically decorated in period. Horses, dogs and even elephants were heraldically decorated in period. You can make a caparison for your dog- or horse if you have one to dress up. - Featuring your heraldic colors and your arms and badges. I suppose you could caparison your cat if she’d tolerate it, though I can’t find documentation for it. Paint or stencil your arms and badges on the cloth cover-ups that you make for your ice chest, camp chairs, barbecues and plastic boxes. Put up a canvas wall around your modern tent with your charges diapered overall. Just for fun- or, if you can’t hide it, decorate it! Paint your arms on shield or lozenge-shaped magnetized sheets to slap on your car’s doors or hood. Paint your arms on your tourney trailer. We can’t begin to cover the details of this topic in one article, but generally: For clothing, period techniques included painting, stenciling and block printing, but the most common techniques were embroidery, appliqué, or some combination of the two. Embroideries were worked in silk, wool and precious metals, with precious and semi precious beads often used as well. Metals were stamped, cast, enameled and engraved. Most commonly, pewter and precious metals were used for heraldic display. Wooden objects were carved, painted and enameled and glassware was sometimes etched. Leather can be carved, stamped, painted, or studded with metal mounts. Heraldic display is often a category the Arts and Sciences competitions. If you wish to enter an item in this or any other A & S competition, it’s always best to research first, then start on your project. Find as many references to your object and as many pictures of examples as you can. How was it constructed? When and where did it exist and what materials were used? If you cannot obtain or afford accurate period materials, find a modern analog and explain why you used it in your documentation. Particularly in the area of painted fabrics, many people have been (wrongly) led to believe that it wasn’t done in period. So, if your technique falls into one of these controversial areas you’ll need documentation to back it up. 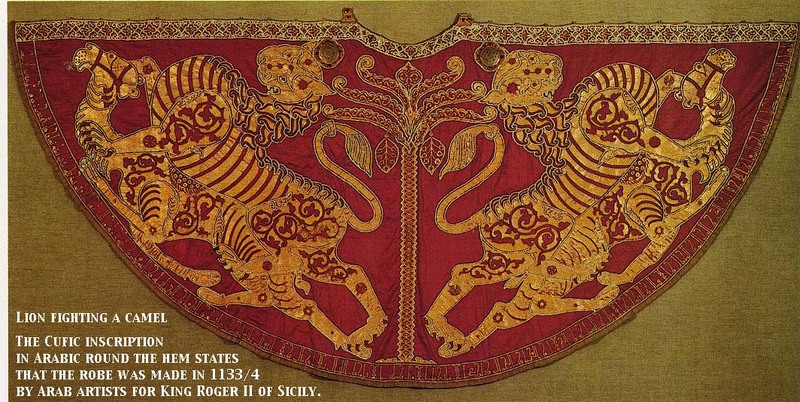 Find examples of similar period heraldic display on garments and accessories. Consult a herald on SCA and Kingdom rules and conventions for display. Read about period objects, the types of wood and construction techniques used. Find out about period paints and carving techniques. Find period examples of the way you want to compose your heraldic display on your furniture or box. The same as all the above. Lots of reading, consult with other artisans, and find period examples and references. We all know that the SCA has many areas in which our practices stray from those of our period. We have rules and conventions peculiar to our organization which will sometimes conflict with historical accuracy. The trick is to be as accurate as possible without violating SCA heraldic conventions or Kingdom sumptuary traditions. Be aware that the rules of heraldic display in sumptuary tradition change from time to time. Coronets & metal circlets are restricted to Royalty, Barons, Thegns, Bannthegns and Royal Peers. Collars of Estate are restricted to Royalty, Peers Territorial Barons, Officers of State and holders of certain awards and/or members of certain orders. Only members of an order may display the insignia or badges of that order. Only the King and Queen and their respective heralds & champions may display the King’s (Kingdom) or Queen’s arms. Only the Baron and Baroness and their respective heralds & champions may display the Barony’s arms. The Seneschal of a smaller branch has the prerogative of displaying shire, march, canton or college arms. You may not display your arms crested with or containing ducal, baronial, county or viscounty coronets unless you personally hold that rank. Consult the college of heralds whenever you are in doubt about the nature or contents of your heraldic display project. Per pale argent and azure, a sun in his splendour. Azure, a pall inverted bretessed argent. Azure, a mountain of three peaks issuant from base vert, fimbriated and snowcapped argent. Friar, Stephan. A Dictionary of Heraldry. Harmony Books, 1987. Friar, Stephan. Heraldry for the Local Historian and Genealogist. Sutton Publishing, 1997. Neubecker, Ottfried. Heraldry: Sources, Symbols and Meaning. Maidenhead: McGraw-Hill Book Co.
(Bannthegn) Rodema de Rohan. The Great Roll of Arms of Atenveldt. Raymond’s Quiet Press, First, Second or Third Edition, 1979, 1980, 1983. (Note: This book, published in 3 editions from 1979 to 1983, illustrated the armory of all Aten Armigers of its time, and was a marvelous guide to Heraldic Display in Atenveldt. Out of print since, it is hard to find, but worth looking at if you can find a copy. Copyright © 2007 Permission is freely granted to reproduce this handout in its entirety for personal use and instructional purposes so long as the author is credited and notified. Permission to use this work in part is denied.